Tlahuizcalpantecuhtli - God of the Dawn. - Aztec God. Tlahuizcalpantecuhtli Lord of the Dawn is the god of the planet Venus the morning star and of the Dawn. 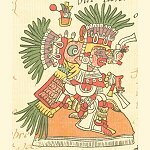 Home ¦ Divinity of the Day ¦ Aztec Gods and Goddesses ¦ Tlahuizcalpantecuhtli - God of the Dawn. Tlahuizcalpantecuhtli - God of the Dawn. Tlahuizcalpantecuhtli ("Lord of the Dawn") is the god of the planet Venus, the morning star and of the Dawn. He was considered a dangerous and malevolent god, causing harm to people by shooting darts. In the Legend of the Suns, tries to shoot the sun with arrows, but misses and shots himself.